If you want a motor car that is uniquely yours and it that kind of finish and attention to detail you’re looking for, Bentley’s Mulliner bespoke coach program will satisfy your need for exclusivity. This Bentley Continental GT V8 S Convertible is an example of what the special bespoke division is capable of offering and creating for you, if you can and are willing to pay the price for your dream car. Designed to attract Bentley lovers at the 2016 Geneva Motor Show, this Continental shows off its Orange Flame over Ghost White livery, with the special body-kit and illuminated treadplates following the Orange theme too. 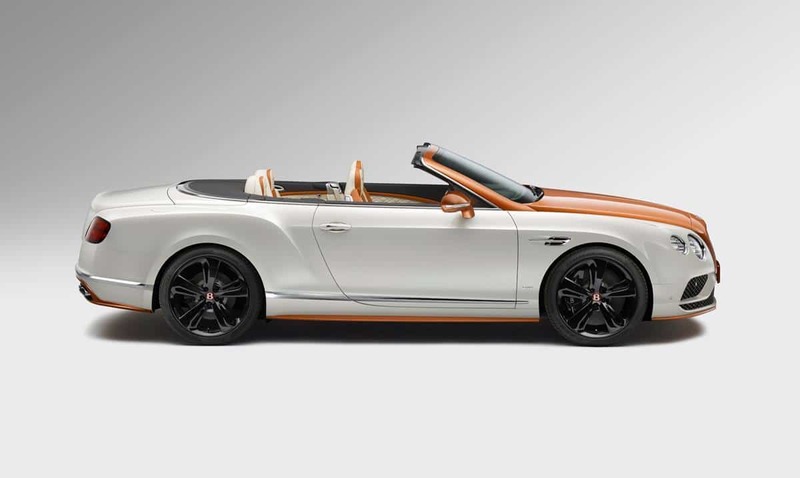 Inside the cabin, the motif continues, this Continental GT V8 S Convertible sports a bespoke tri-tone theme with the leather seats featuring Orange accents and Mulliner embroidered headrests, a Linen and Beluga leather-covered steering wheel, as well as Orange carbon-fiber inserts. Sparkle Carbon has been woven from 3 different fabrics: carbon fiber, copper foil and metal wire before adorning the cabin. The surfaces covered with this special mix have been lacquered and polished, making the driver and his/her passengers feel as spoiled as ever. The Breitling for Bentley clock inside the car has also been color matched to Orange Flame. This Supermototcar was sold right off the stand at Geneva. But this is just 1 of the many bespoke examples of how Mulliner can make a car individual.